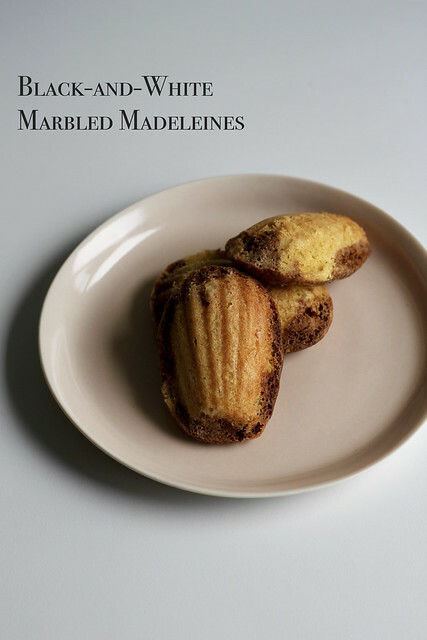 Over the last nine years, I’ve made many Dorie versions of the little shell-shaped cakes called madeleines. Appearance-wise, these Black-and-White Marbled Madeleines were probably not my best effort. I could tell I would have a little more batter than I needed, but overfilled the molds a bit anyway because: a) I was too lazy to clean the pan and do a second bake-off, and b) I’m too cheap to ever throw out batter. So my edges weren’t the sharpest. I didn’t get the signature madeleine bump this time either…I probably should have rested the batter for several hours instead of just one. Also my marbling technique wasn’t great. But hey– at least I know what my problems were! Taste and texture-wise, they were great. The vanilla-chocolate combo is a classic, obviously, and the little bit of citrus zest (I used bergamot instead of lime) made them extra flavorful. They were soft and spongy fresh out the oven…I don’t know how well they hold up because they didn’t last! 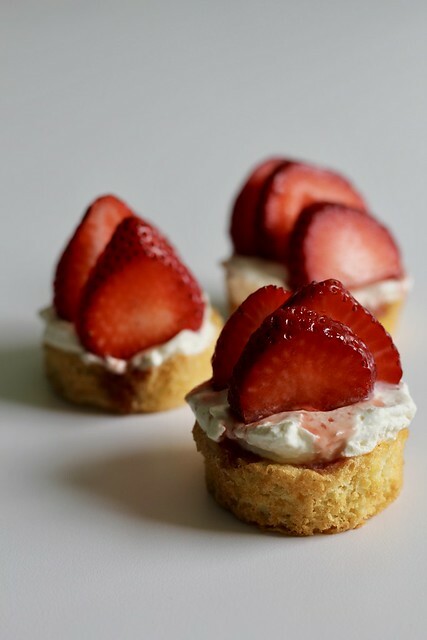 I wouldn’t hesitate to give these a go again and be a bit more of a perfectionist when baking them the second time around. 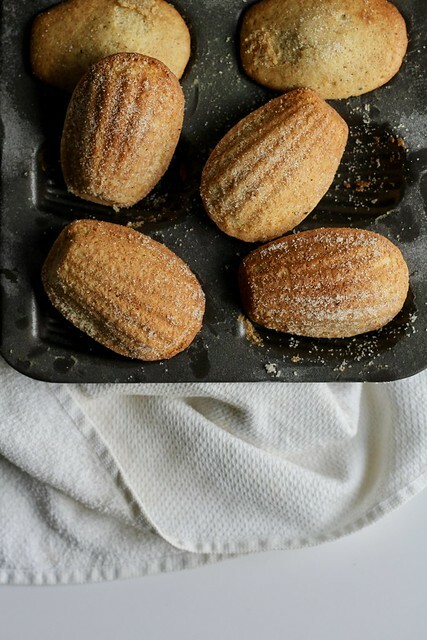 By now, I’ve made several of Dorie’s madeleine recipes, but these Lemon Madeleines were the first to give me that coveted backside bump! The trick, apparently, is to keep the batter super-cold until the second the shell-shaped pan hits the oven. Hmmm…perhaps I should revisit one of the older recipes (chai was a favorite)? I like madeleines, but I never really think of them until they roll around for TWD. They’re easy enough to make…the batter is quickly whisked together by hand and it can even out in the fridge for a few days. Madeleines are for sure best eaten fresh, so it’s handy to be able to bake them off as you want them (I did about four a day until the batter was gone). These ones came out nice and spongy. And lemony, of course, because of zest in the batter and juice in the glaze. 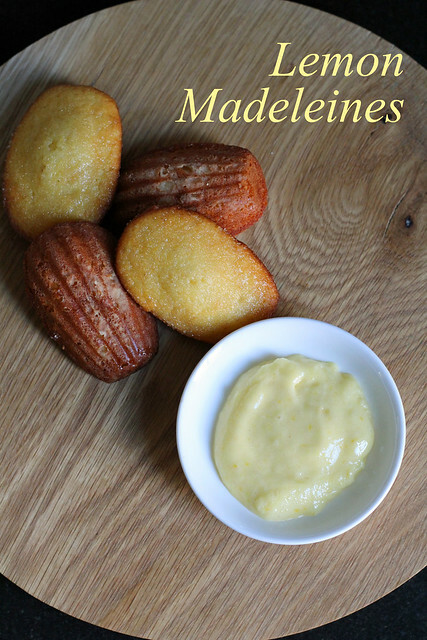 Madeleines often find themselves dunked into a cup of tea, but there was some lemon curd left from last week’s BWJ recipe, so we swiped them in that. 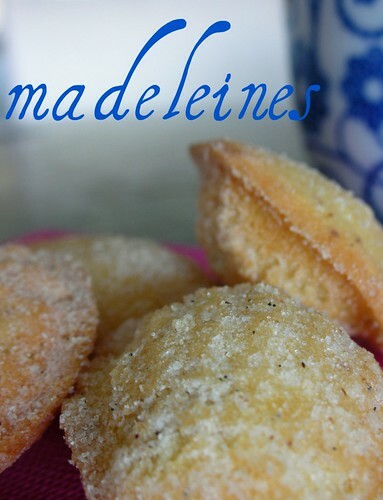 The fourth and final madeleine recipe from the book…you can tell Dorie lives in Paris! The original recipe calls for an Earl Grey tea infusion to give these cookie/cakes flavor, but I usually only have one or two types of tea kicking around my cupboard at a time, and the Earl wasn’t one of them. So I used chai (from a teabag actually…I tore the bag open and sprinkled the bits into my hot butter to infuse; then I put it through a very fine strainer to remove any sediment). I thought the chai spices would be nice with the honey that was already in the ingredient list. I could really taste the tea in here. They were delicious, and I amped up the spicing even more by tossing them in a cardamom sugar while they were still warm. I made big, full-sized madeleines…I didn’t really get the pronounced madeleine bump with these, but they had rounded backsides and great texture and taste, so I guess I don’t mind so much. For the recipe, see Baking: From My Home to Yours by Dorie Greenspan or read Bakeologie. And see Grandma’s Kitchen Table for Honey-Almond Fig Tart, this week’s other recipe (which I unfortunately didn’t get a chance to make this week). Don’t forget to check out the TWD Blogroll! 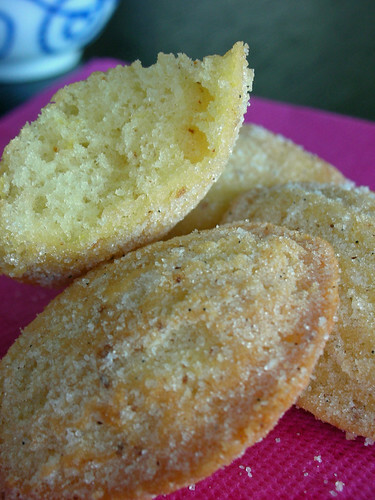 OK, Tuesday has come and gone (happy 11/11/11, by the way), but I did bake both of this week’s TWD recipes, so I wanted to show you my Mini Madeleines as well. Better late than never, right? 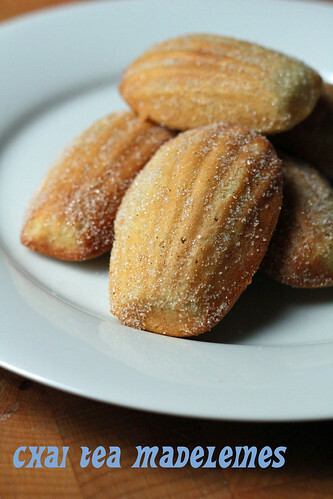 I like madeleines…so much that I got a little greedy and swiped one from my photo session…oops. 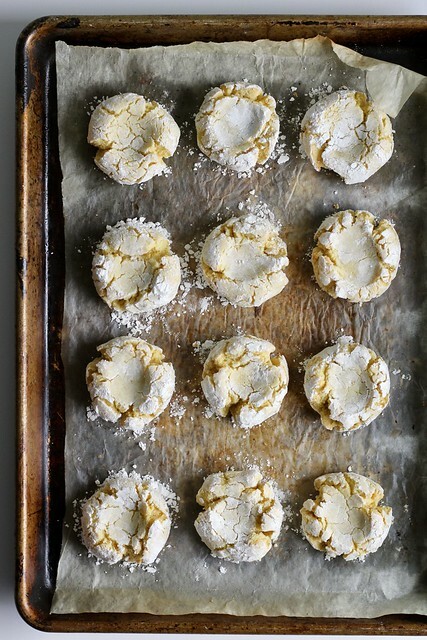 *Little cakes that disguise themselves as shell-shaped cookies– how cute! *A batter that’s hand-whisked and allowed to rest for as long as a couple of days– how easy! 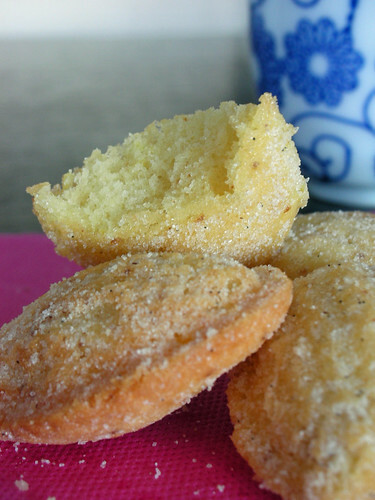 *A soft crumb that you can flavor a zillion different ways– how tasty! 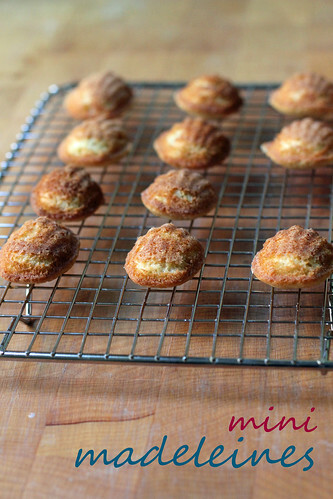 If you’ve avoided making them because you don’t have the traditional madeleine baking pan, I’m pretty sure a mini muffin tin would make a fine substitute. I browned my butter for these and used lots of lemon zest. They had great flavor and were nice with chamomile tea. For the recipe, see Baking: From My Home to Yours by Dorie Greenspan or read Di’s Kitchen Notebook. Don’t forget to check out the TWD Blogroll! Whenever I start a new food job, my new coworkers always seem to ask me where I’m from. I’m going through this phase at my job right now, and sometimes the question makes me scratch my head…like, what was the last place I worked for, or where did I grow up? I’ve come to realize that, more often than not, the person asking has recently moved to NYC from someplace else, and is wondering about my hometown. While I think a lot about the places and people I grew up with, the day I left for college in the early ’90s was the last time I was ever in my childhood home…my parents packed up and moved cross-country a few weeks later. And, apart from the two years I spent in Sydney, I’ve been in New York since 1996. Sometimes I think that I’m more Brooklyn than NoVA now, but I don’t, and wouldn’t ever want to, forget where I’m from. 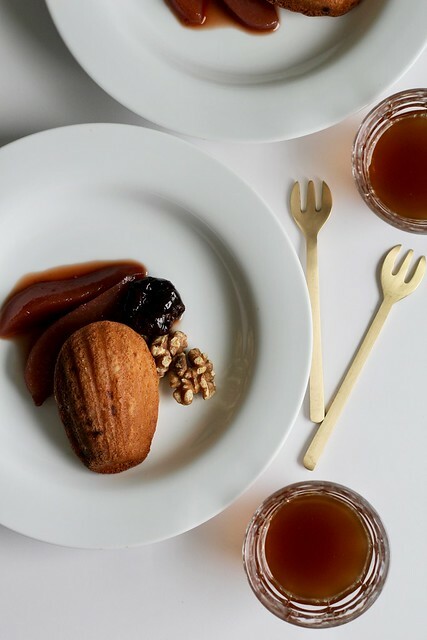 If you asked a Fluff-Filled Chocolate Madeleine where it’s from, it would probably tell you, that while it was born in France, it has spent the last couple decades living in Texas. A plate of these guys would likely not make Proust remember anything, but one taste would probably shoot most American grown-ups right back to childhood! 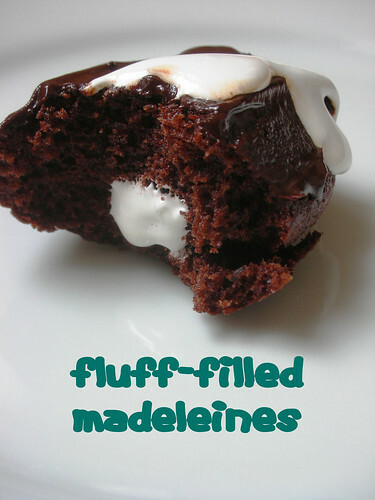 Apart from their scalloped shape and cakey texture, they are pretty far removed from their French origins, but with ganache and marshie Fluff, they are instantly recognizable to me. A couple of tips if you want to make these yummies at home: if you nuke your Fluff jar for 5-10 seconds, it will be much easier to get the sticky stuff out of the jar and into a piping bag; also, madeleines stale quickly, so if you like them soft, eat them soon after they’re put together. For the recipe, see Baking: From My Home to Yours by Dorie Greenspan (it’s also here on Serious Eats) or read Effort to Deliciousness, as it was Margot’s pick this week. Don’t forget to check out the TWD Blogroll!